I’m sorry people, but I have been busy out of my mind with work and life. I will try to get back into the swing of things. I have a TON of photos of process and post. 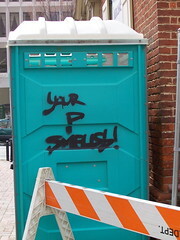 In the meantime, it’s tasteless graffiti.